Are you looking for a party bus in Fenton? If so, then your search has now finally come to an end. 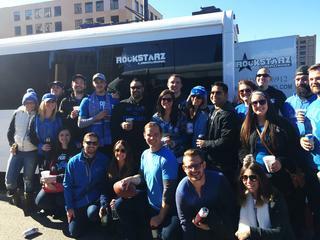 Here at Rockstarz Limousine and Party Bus, we not only specialize in providing our clients with a party bus that generates an amazing atmosphere, but we are also proud of the quality of the service that we can offer. Anybody that wishes to rent a party bus will always be concerned about a number of things. However, we seek to resolve those issues or settle those concerns as quickly as possible. For example, we know that most people are worried about space issues, which is why we have tried to make better use of the space on board to then allow you to invite even more guests than ever before. Our Fenton party bus rental service is also designed to provide you and your guests with the perfect setting for your party. As soon as you all board, you will feel as if you have been transported into your private nightclub thanks to the décor and atmosphere in our party bus. From the sound system to the leather chairs as well as the laser light display, this is unlike any bus you have ever been on before. In the past, individuals have used our Fenton party bus service to help with a number of different occasions. From a special birthday, to an anniversary, or perhaps even just a place for you and your friends to have a party for no real reason other than you love to do it, we can help with each and every possibility. So, if you live in the Fenton area and are looking for a party bus, then make life easier for yourself by giving us a call here at Rockstarz Limousine and Party Bus. Alternatively, you can contact us via our website and someone will be in touch as soon as possible.